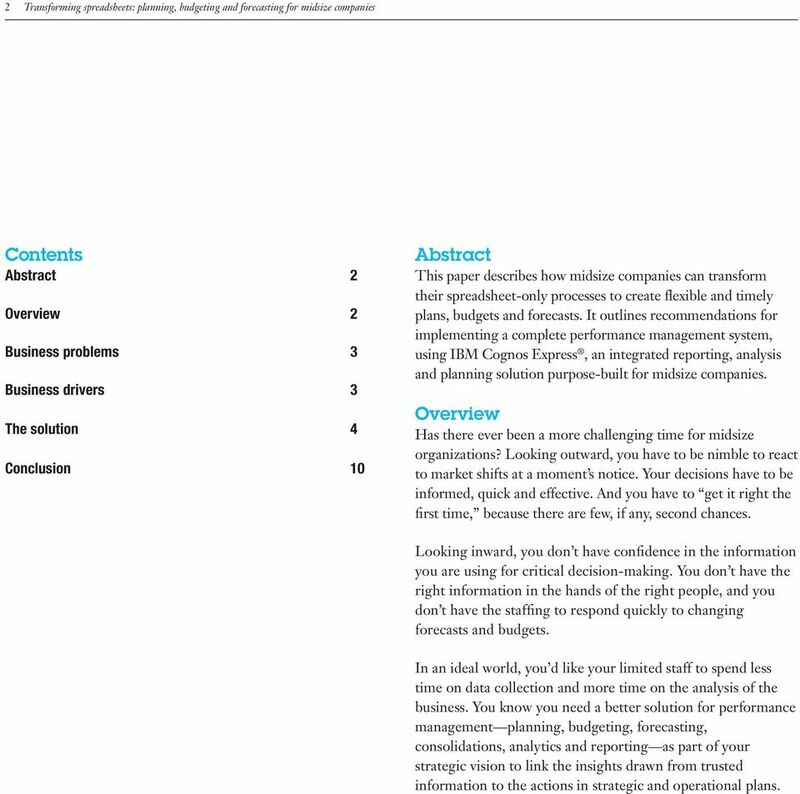 Download "Transforming spreadsheets: planning, budgeting and forecasting for midsize companies"
2 2 Transforming spreadsheets: planning, budgeting and forecasting for midsize companies Contents Abstract Overview Business problems Business drivers The solution Conclusion Abstract This paper describes how midsize companies can transform their spreadsheet-only processes to create flexible and timely plans, budgets and forecasts. 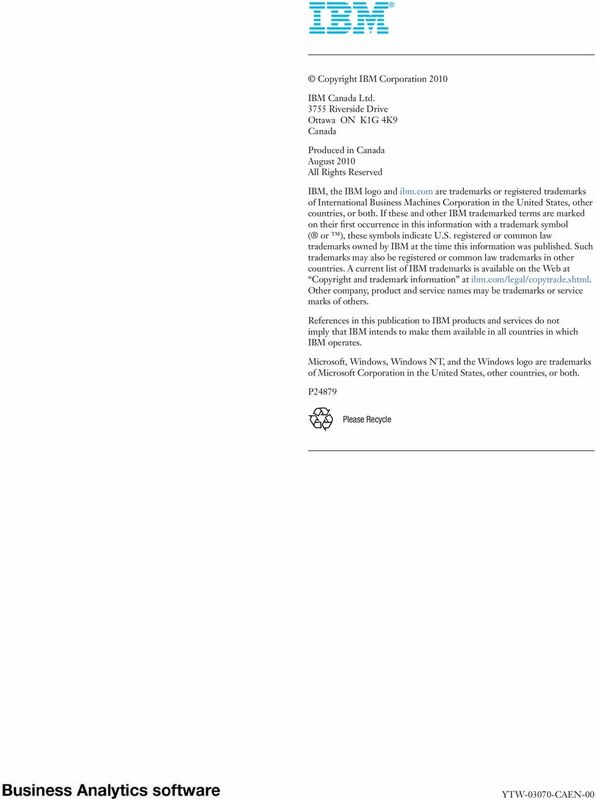 It outlines recommendations for implementing a complete performance management system, using IBM Cognos Express, an integrated reporting, analysis and planning solution purpose-built for midsize companies. Overview Has there ever been a more challenging time for midsize organizations? Looking outward, you have to be nimble to react to market shifts at a moment s notice. Your decisions have to be informed, quick and effective. And you have to get it right the first time, because there are few, if any, second chances. Looking inward, you don t have confidence in the information you are using for critical decision-making. You don t have the right information in the hands of the right people, and you don t have the staffing to respond quickly to changing forecasts and budgets. In an ideal world, you d like your limited staff to spend less time on data collection and more time on the analysis of the business. You know you need a better solution for performance management planning, budgeting, forecasting, consolidations, analytics and reporting as part of your strategic vision to link the insights drawn from trusted information to the actions in strategic and operational plans. 3 Cognos Software 3 Business problems In today s world, cost-cutting measures and making the most of existing resources have become the order of the day. It s often difficult to find the resources to dedicate to comprehensive planning, budgeting and forecasting. And if you re like most midsize businesses, you probably think these kinds of performance management applications are beyond your means. So you continue to rely on the familiar spreadsheet for just about all of your performance management needs. You re not alone. Organizations of every size use spreadsheets for core financial functions such as strategic planning, financial reporting and consolidation. However, spreadsheet proliferation for performance management exposes many organizations to significant levels of risk. Spreadsheets require labor-intensive manual processes, are highly error-prone, are difficult to consolidate, exhibit poor or invalid data integration and lack access and version control. These risks and inefficiencies can be costly as well. Business drivers Despite the known risks, spreadsheets are here to stay and for good reason. They provide the control or lack of dependence from IT and are familiar, flexible and accessible throughout the organization. The challenge for the IT organization is to reduce spreadsheet risks by employing a performance management solution that leverages spreadsheets and eliminates the risks and inefficiencies. The goal? To replace or augment spreadsheets wherever possible with planning applications that integrate easily with spreadsheets and deliver greater business efficiencies. Managing spreadsheet risk need not be an either/or proposition an impossible choice between high-risk spreadsheets and the perceived high-cost of new planning, budgeting and forecasting applications. Especially at a time of budget belt-tightening, flexible and cost-efficient performance management can be achieved by leveraging the best of your existing spreadsheet investment with an integrated, fullfeatured planning, budgeting and forecasting solution. 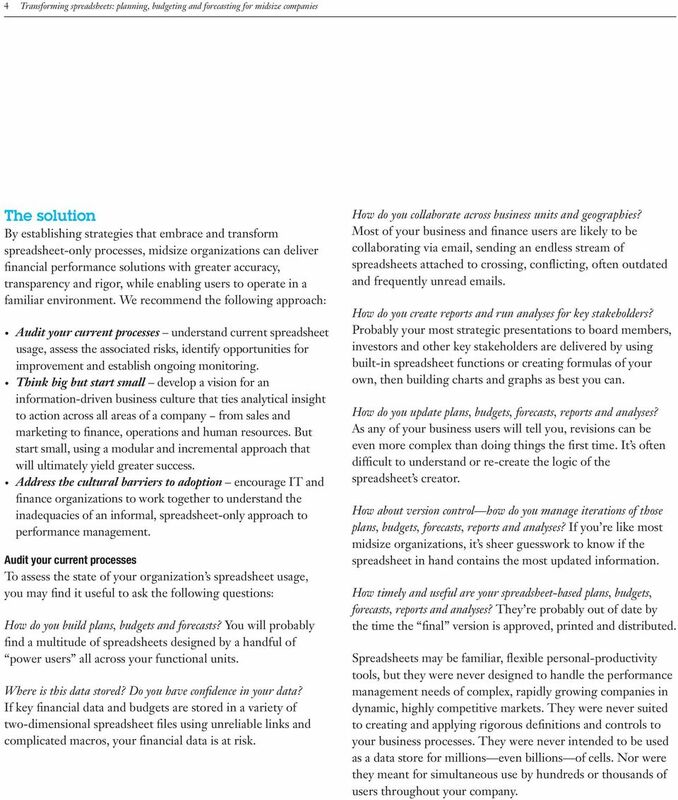 4 4 Transforming spreadsheets: planning, budgeting and forecasting for midsize companies The solution By establishing strategies that embrace and transform spreadsheet-only processes, midsize organizations can deliver financial performance solutions with greater accuracy, transparency and rigor, while enabling users to operate in a familiar environment. We recommend the following approach: Audit your current processes understand current spreadsheet usage, assess the associated risks, identify opportunities for improvement and establish ongoing monitoring. Think big but start small develop a vision for an information-driven business culture that ties analytical insight to action across all areas of a company from sales and marketing to finance, operations and human resources. But start small, using a modular and incremental approach that will ultimately yield greater success. Address the cultural barriers to adoption encourage IT and finance organizations to work together to understand the inadequacies of an informal, spreadsheet-only approach to performance management. Audit your current processes To assess the state of your organization s spreadsheet usage, you may find it useful to ask the following questions: How do you build plans, budgets and forecasts? You will probably find a multitude of spreadsheets designed by a handful of power users all across your functional units. Where is this data stored? Do you have confidence in your data? If key financial data and budgets are stored in a variety of two-dimensional spreadsheet files using unreliable links and complicated macros, your financial data is at risk. How do you collaborate across business units and geographies? Most of your business and finance users are likely to be collaborating via , sending an endless stream of spreadsheets attached to crossing, conflicting, often outdated and frequently unread s. How do you create reports and run analyses for key stakeholders? Probably your most strategic presentations to board members, investors and other key stakeholders are delivered by using built-in spreadsheet functions or creating formulas of your own, then building charts and graphs as best you can. How do you update plans, budgets, forecasts, reports and analyses? As any of your business users will tell you, revisions can be even more complex than doing things the first time. It s often difficult to understand or re-create the logic of the spreadsheet s creator. How about version control how do you manage iterations of those plans, budgets, forecasts, reports and analyses? If you re like most midsize organizations, it s sheer guesswork to know if the spreadsheet in hand contains the most updated information. How timely and useful are your spreadsheet-based plans, budgets, forecasts, reports and analyses? They re probably out of date by the time the final version is approved, printed and distributed. Spreadsheets may be familiar, flexible personal-productivity tools, but they were never designed to handle the performance management needs of complex, rapidly growing companies in dynamic, highly competitive markets. They were never suited to creating and applying rigorous definitions and controls to your business processes. They were never intended to be used as a data store for millions even billions of cells. Nor were they meant for simultaneous use by hundreds or thousands of users throughout your company. 5 Cognos Software 5 IBM Cognos Express offers a complete, integrated solution for a midsize company s reporting, analysis and planning needs. Think big but start small If you think that enterprise-class performance management solution suites are beyond your means and spreadsheets alone can t come close to meeting your needs, where do you turn? Success in a dynamic marketplace depends on getting the right information to and from the right people at the right time. Success requires an integrated performance management solution that ties analytical insight to action, and one that scales across your business to drive decision-making from the storeroom to the boardroom. You can achieve these goals with an integrated reporting, analysis and planning solution, such as IBM Cognos Express, which allows you to take a modular and incremental approach to performance management. Start small with the capabilities you need now, such as reporting or planning, and expand your performance management solution over time to meet your goals. This incremental strategy enables midsize companies to match their business needs to budget and resource constraints and grow over time. IBM Cognos Express provides a complete and integrated performance management environment that supports planning, budgeting and forecasting as well as consolidation, reporting and analytics. It automates and manages performance management processes by engaging, empowering and monitoring executives, line-of-business managers and staff across functional areas and business units. For example, with Cognos Express you can create high-level plans, assign responsibility for providing information and track progress until plans are complete. This flexible, accurate planning environment blends a structured, managed workflow with personalized analysis and reporting for improved business agility across the organization. Let s look at how your current spreadsheet-only processes can be transformed to an effective performance management solution with IBM Cognos Express. 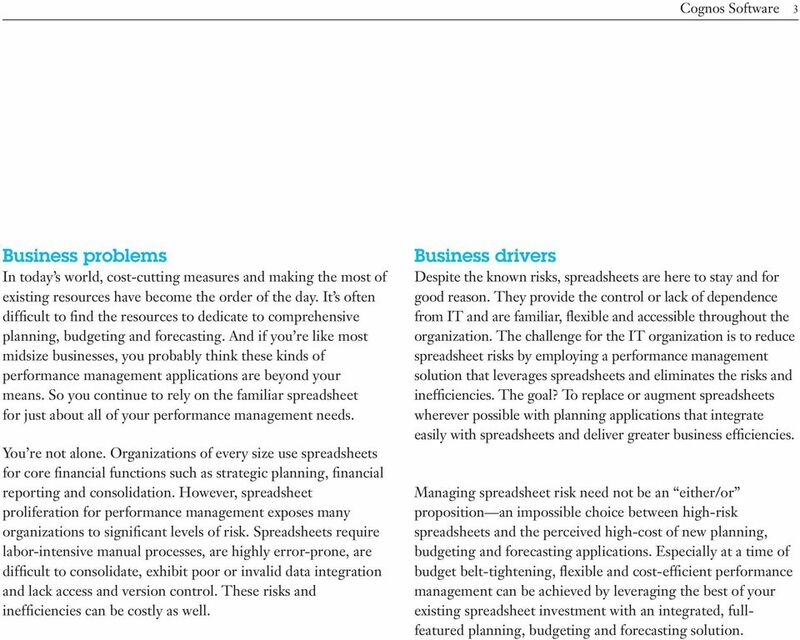 6 6 Transforming spreadsheets: planning, budgeting and forecasting for midsize companies Eliminate spreadsheet errors. Spreadsheet-only solutions are fundamentally error-prone. Whether stemming from users (hitting the wrong key), from logic (choosing or creating an inappropriate formula) or from omission (leaving out a critical model component like a row or column), calculation errors are nearly guaranteed. In fact, recent research shows that 94 percent of spreadsheet models are seriously flawed in one way or another. Make confident decisions. IBM Cognos Express offers a centralized, single performance management solution that encompasses data management, planning, budgeting, forecasting, consolidation, reporting and analysis. It facilitates high participation and collaboration across your company, yet offers managed workflow that enables closely monitored data collection, rapid aggregation, clearly defined rules and hierarchies, a rigorous approval process, role-based security and a clear audit trail that facilitates accountability and accuracy. Gain greater insight through multidimensional analysis. Even in smaller companies, financial and business data is simply too complex to be effectively stored, managed and utilized in two-dimensional, row-and-column spreadsheets. When you need to assess product-line profitability by cost-ofgoods sold, by item, by customer demographic, by region, by sales rep and so on, you need more firepower than linked spreadsheets and even the cleverest macros. And when one measure changes, how do you know that those changes will accurately percolate all through your spreadsheet model? Typically, you don t. IBM Cognos Express uses an in-memory analytic server that centrally manages business hierarchies, rules, calculations and data. With either a user-friendly Web interface or the familiar Microsoft Excel front-end, you can read and write to your data set and then see results instantly. You can slice-and-dice data across multiple dimensions to match the planning, forecasting or reporting needs of the moment all in real time. Read/write access is controlled by role-based security and changes are instantly propagated to all users. Collaborate throughout the company. Successful performance management requires high levels of collaboration and participation: the greater the cross-company input, the greater the resulting accuracy and insight. But due to deployment difficulty (and error frequency), spreadsheet-based performance management demands a constrained, centralized process that can represent only a small part of your company stakeholders. IBM Cognos Express allows you to involve more people more often in your performance management process. Data from across your company becomes valuable information when it can rapidly flow via the Web to and from process contributors and management decision-makers. Current plans are visible to stakeholders, and all users have read-and-write capability as required for contribution, ad hoc analyses and what-if scenarios. And a rich Web interface is perfect for a distributed environment where many of your team members work remotely across business units and geographies. 7 Cognos Software 7 An intuitive planning environment blends a structured, managed workflow with personalized analysis for improved business agility. Automate workflows. With a spreadsheet-only performance management solution, managing process workflow is nearly impossible. You re never quite sure if data contributors are progressing according to plan or if they ve begun work at all. And with spreadsheets, greater participation does not mean greater effectiveness. IBM Cognos Express helps guide the performance management process by enabling finance and line-of-business managers to assign functional responsibility to individuals or groups. Contributors submit data according to schedule, and tasks are designated as not started, in progress, approved, rejected or not delegated. Reviewers monitor progress and accept or reject contributions as needed. 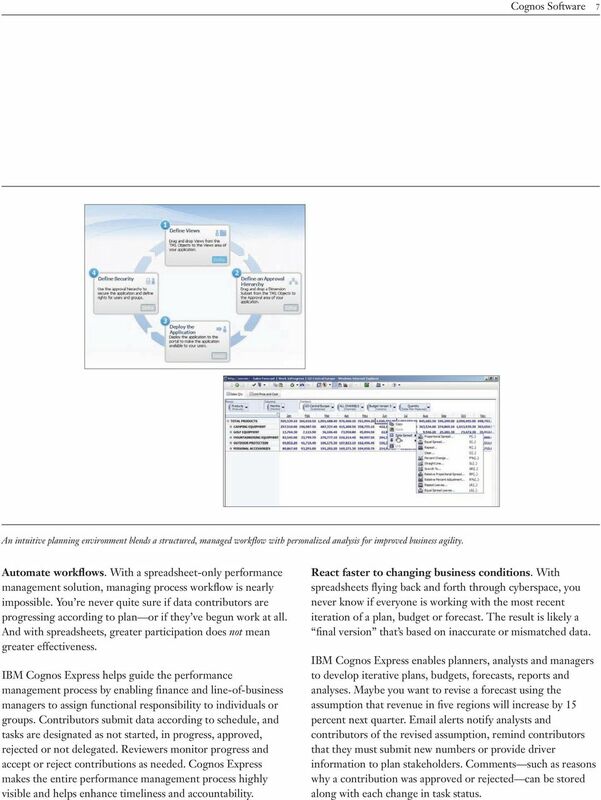 Cognos Express makes the entire performance management process highly visible and helps enhance timeliness and accountability. React faster to changing business conditions. With spreadsheets flying back and forth through cyberspace, you never know if everyone is working with the most recent iteration of a plan, budget or forecast. The result is likely a final version that s based on inaccurate or mismatched data. IBM Cognos Express enables planners, analysts and managers to develop iterative plans, budgets, forecasts, reports and analyses. Maybe you want to revise a forecast using the assumption that revenue in five regions will increase by 15 percent next quarter. alerts notify analysts and contributors of the revised assumption, remind contributors that they must submit new numbers or provide driver information to plan stakeholders. Comments such as reasons why a contribution was approved or rejected can be stored along with each change in task status. 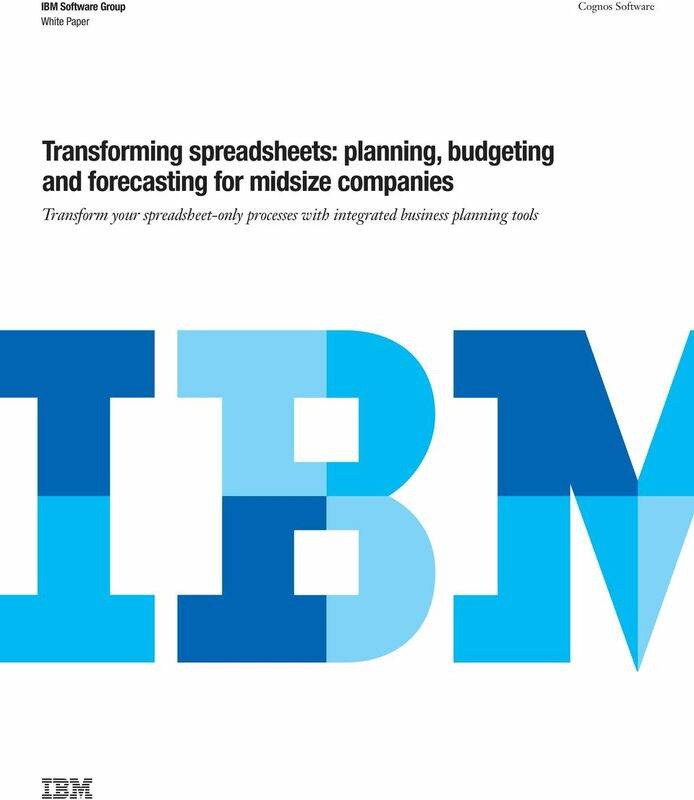 8 8 Transforming spreadsheets: planning, budgeting and forecasting for midsize companies Simplify data aggregation. Consolidating input from multiple users and spreadsheets also inhibits performance management process effectiveness. A single person or group has to collect the numerous spreadsheets and unite them in a single version. Even if individual spreadsheets are error-free, aggregation is a huge task that can drag on for weeks. IBM Cognos Express streamlines data aggregation and lets you perform fast and precise data loads. It easily connects to any ODBC-compliant database, to Excel workbooks and even to ASCII files from legacy systems. And it can export data into ASCII files or any ODBC-compliant database to facilitate reconciliation. Address the cultural barriers to adoption Spreadsheet-based approaches to performance management are so flawed and cumbersome that line-of-business managers regard them as untrustworthy. In-the-trenches staff have learned by hard experience that the numbers are likely wrong, out-of-date and out-of-touch with reality. And yet, despite the obvious shortcomings of spreadsheets, IT departments are likely to encounter push-back against replacing spreadsheets with analytic applications. To move past these objections, companies should assemble a team of IT and finance professionals who, together, can identify their requirements for a comprehensive, trusted and secure performance management system. An error-prone, cumbersome spreadsheet-based performance management process does not engender confidence. It does not allow your company to analyze results, react to market change, ask and answer what-if questions, then alter plans, budgets or forecasts rapidly and effectively. Real-time response is virtually impossible, and as a midsize business you re at a competitive disadvantage against larger companies in your space. 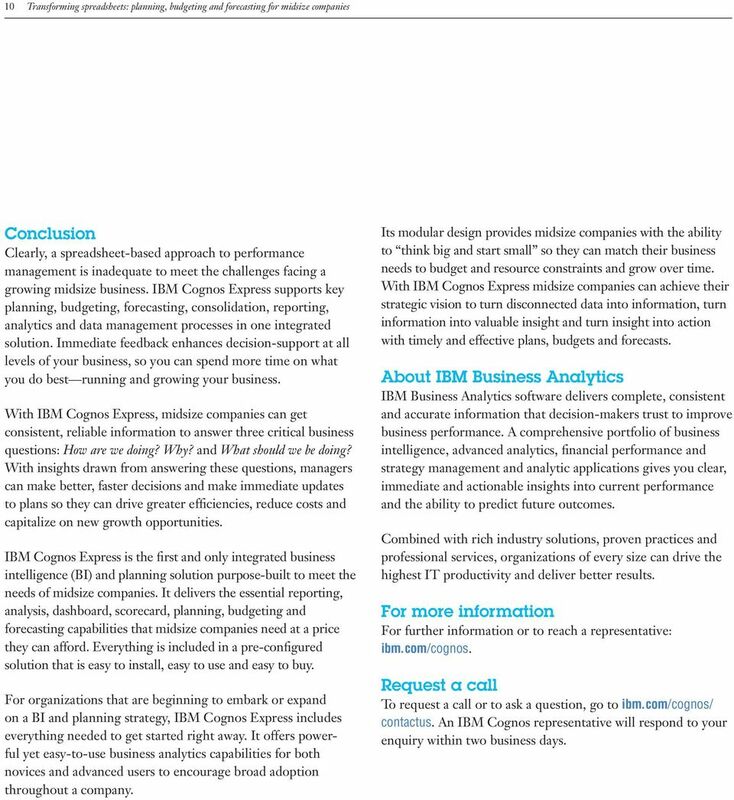 IBM Cognos Express gives you critical performance information when you need it. At its core is a powerful in-memory, multidimensional analytic server that enables lightning fast what-if calculations. IBM Cognos Express is the only purpose-built performance management product for midsize companies that can model what-if scenarios in real time essential for survival in challenging economic times. 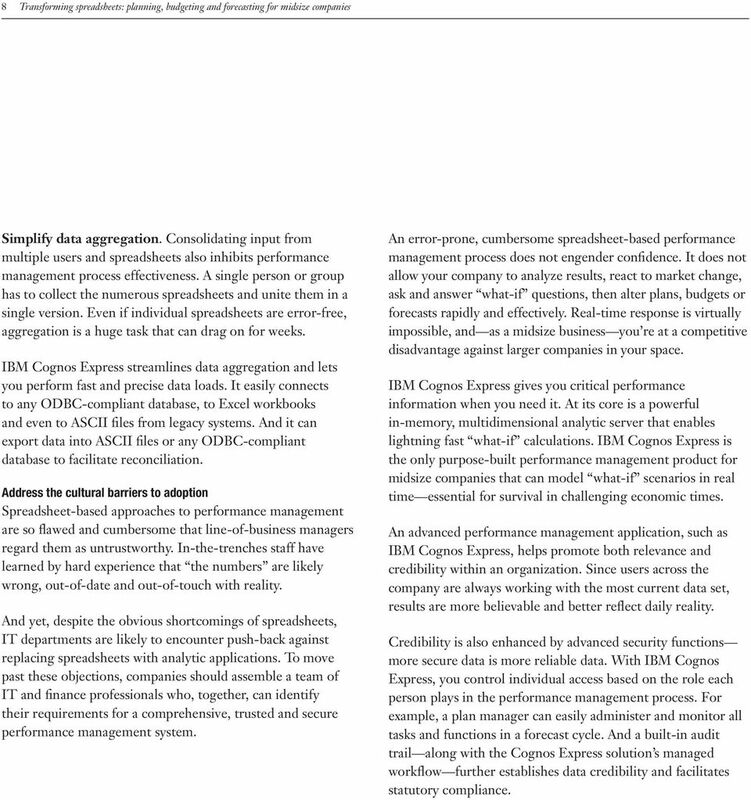 An advanced performance management application, such as IBM Cognos Express, helps promote both relevance and credibility within an organization. Since users across the company are always working with the most current data set, results are more believable and better reflect daily reality. Credibility is also enhanced by advanced security functions more secure data is more reliable data. With IBM Cognos Express, you control individual access based on the role each person plays in the performance management process. For example, a plan manager can easily administer and monitor all tasks and functions in a forecast cycle. And a built-in audit trail along with the Cognos Express solution s managed workflow further establishes data credibility and facilitates statutory compliance. 9 Cognos Software 9 Business users can define a new planning application with a point and click through four simple steps. Plan contributors can use a Web interface to conduct what-if scenarios before committing. 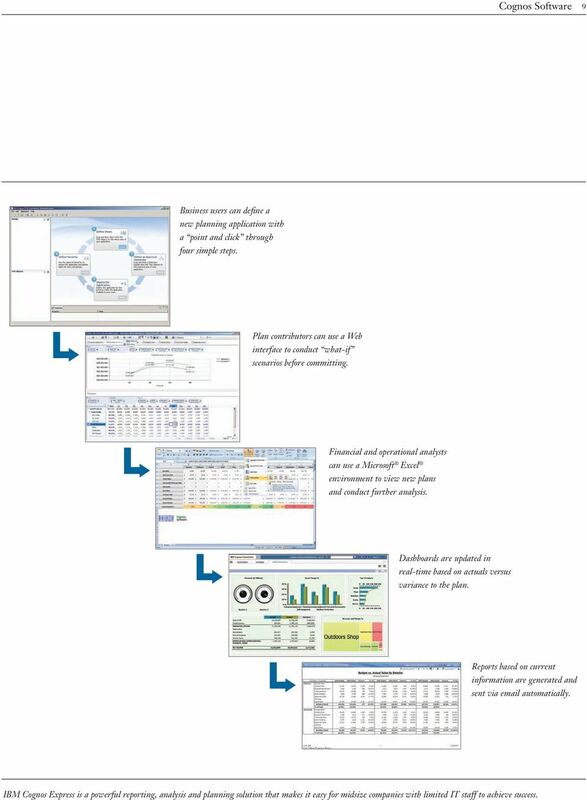 Financial and operational analysts can use a Microsoft Excel environment to view new plans and conduct further analysis. Dashboards are updated in real-time based on actuals versus variance to the plan. Reports based on current information are generated and sent via automatically. IBM Cognos Express is a powerful reporting, analysis and planning solution that makes it easy for midsize companies with limited IT staff to achieve success. 10 10 Transforming spreadsheets: planning, budgeting and forecasting for midsize companies Conclusion Clearly, a spreadsheet-based approach to performance management is inadequate to meet the challenges facing a growing midsize business. IBM Cognos Express supports key planning, budgeting, forecasting, consolidation, reporting, analytics and data management processes in one integrated solution. Immediate feedback enhances decision-support at all levels of your business, so you can spend more time on what you do best running and growing your business. With IBM Cognos Express, midsize companies can get consistent, reliable information to answer three critical business questions: How are we doing? Why? and What should we be doing? With insights drawn from answering these questions, managers can make better, faster decisions and make immediate updates to plans so they can drive greater efficiencies, reduce costs and capitalize on new growth opportunities. IBM Cognos Express is the first and only integrated business intelligence (BI) and planning solution purpose-built to meet the needs of midsize companies. It delivers the essential reporting, analysis, dashboard, scorecard, planning, budgeting and forecasting capabilities that midsize companies need at a price they can afford. Everything is included in a pre-configured solution that is easy to install, easy to use and easy to buy. For organizations that are beginning to embark or expand on a BI and planning strategy, IBM Cognos Express includes everything needed to get started right away. It offers powerful yet easy-to-use business analytics capabilities for both novices and advanced users to encourage broad adoption throughout a company. Its modular design provides midsize companies with the ability to think big and start small so they can match their business needs to budget and resource constraints and grow over time. With IBM Cognos Express midsize companies can achieve their strategic vision to turn disconnected data into information, turn information into valuable insight and turn insight into action with timely and effective plans, budgets and forecasts. About IBM Business Analytics IBM Business Analytics software delivers complete, consistent and accurate information that decision-makers trust to improve business performance. A comprehensive portfolio of business intelligence, advanced analytics, financial performance and strategy management and analytic applications gives you clear, immediate and actionable insights into current performance and the ability to predict future outcomes. Combined with rich industry solutions, proven practices and professional services, organizations of every size can drive the highest IT productivity and deliver better results. 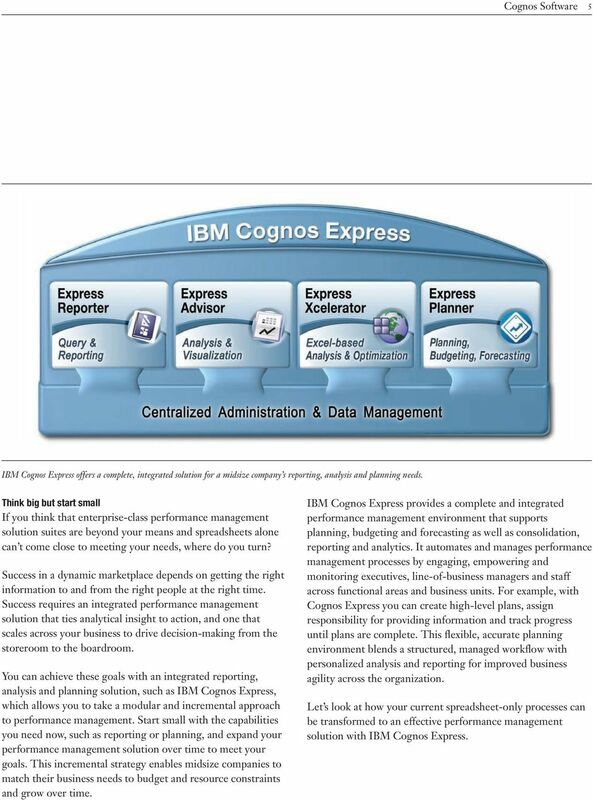 For more information For further information or to reach a representative: ibm.com/cognos. Request a call To request a call or to ask a question, go to ibm.com/cognos/ contactus. An IBM Cognos representative will respond to your enquiry within two business days.